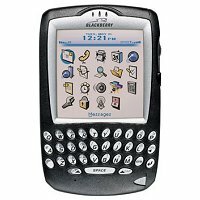 Some Blackberry Users Experience Pain | BlackBerry Blast! According to this article by the Chicago Tribune, many Blackberry users are experiencing thumb and wrist pain due to excessive Blackberry use. Apparently, the American Society of Hand Therapists issued a recent alert saying handheld electronics are causing an increasing number of carpal tunnel syndrome and tendinitis cases. Because of the increasing number of cases they have even come up with a name for the condition, "overuse syndrome," or "BlackBerry Thumb."